Closed: New Years Day, Memorial Day, Independance Day, Labor Day, Thanksgiving Day and Christmas Day. You will also find the great assortment of all the standard uniforms, supplies, badges, awards, books, camping equipment and many other items to fulfill your Scouting needs. The East Bay Scout Shop accepts phone, fax, and mail orders. To see the latest in official merchandise, go to www.scoutshop.org. This site includes all the items found in the Official Catalog, and you can even order online. This virtual Scout shop includes many features designed to simplify the ordering process like uniform bundle pages that can create a complete listing of uniform parts and accessories based on a customer's size and program affiliation. The East Bay Scout Shop accepts Discover, Mastercard, VISA, American Express cards and BSA gift cards. You are the final judge of our products. We guarentee every customer's satisfaction. If for any reason, you are dissatisfied with any item purchased from the Boy Scouts of America, you can either exchange the item for a replacemnt or recieve a full and complete refund. You may be asked for a reason for the return so information may be passed to the apporopriate department. No cash will be returned without a receipt. Other refunds will be applied to a BSA gift card or credit card. Videos, Tapes, and CDs may be returned upopened for a full refund. Once opened, items may only be exchanged for the same title. You may contact the Scout Shop at (510) 633-2005 to discuss these policies. 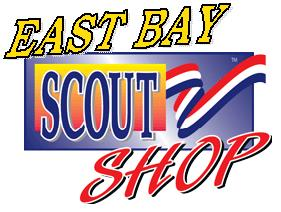 The East Bay Scout Shop is owned and operated by the Boy Scouts of America's National Office. A portion of each sale benefits the San Francisco Bay Area Council. The BSA has also licensed the following retail locations to service your merchandising needs. Thank you for your patronage to San Francisco Bay Area Council, BSA Distrubutors!